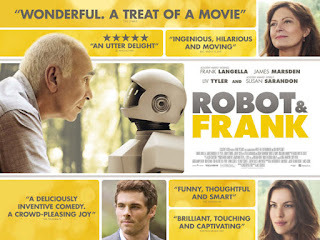 One of my favourite films of 2013 will undoubtedly be 'Robot & Frank', a warm-hearted romantic comedy-drama that beautifully explores notions of humanity, friendship and old age. It's out now in UK cinemas and, although this is an overused term, is quite frankly a must-see. It's well worth sticking around for the end credits too, mainly because of the excellent 'Fell On Your Head' by Francis And The Lights, which plays the film out. The track truly captures the meditative aspects of 'Robot & Frank' but equally, the underlying whimsy of what becomes a touching and amusing friendship between an elderly man and his robot. Then there's the appropriately futuristic synth line. This is basically Francis And The Lights doing Phil Collins with a Phoenix twist. And a bit of Enya thrown in. Somewhat staggeringly, 'Fell On Your Head' still isn't available for release, months and months after its US release. Apparently, Francis And The Lights is tweaking the track for an appearance on his next album, although I can't imagine it'll get much better than this already incredible song. The entire score from Francis And The Lights is, in fact, quite terrific - perfectly matching the film's tone with a humbling minimalism. 'Robot & Frank' is playing in UK cinemas now. Find more info on Francis And The Lights at francisandthelights.com.